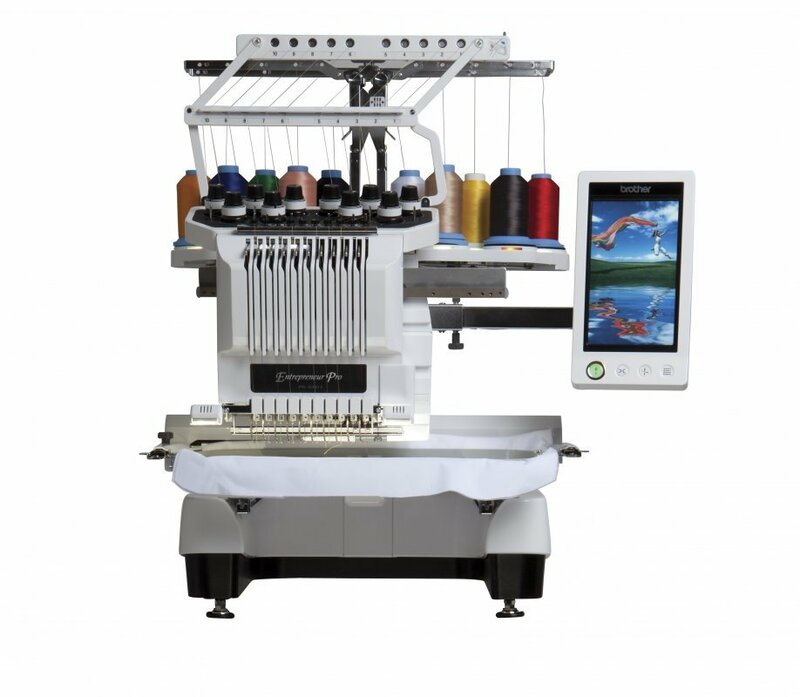 Experience the Next Dimension in innovation, creativity, productivity, and expansive space with the innovative Entrepreneur® Pro PR1000 10-needle home embroidery machine. The PR1000 raises the bar in embroidery for hobbyists, crafters and home-based entrepreneurs, with its 10 needles, InnovaChrome™ Thread Color System, InnovEye® technology, and more. The state-of-the-art InnovaChrome™ system provides colored LED lights under each spool, making thread color selection easy - simply match your thread color to the LED light color under each spool. The lights also double as a visual status system, so you can spend less time supervising the machine. And with the enhanced InnovEye® technology, you can view, in real time, a sharp, magnified view of the needle area – it's like a having a built-in camera above the needle. As an added bonus, the included PE-DESIGN® Next Upgrade software* offers the ability to link up to four Brother PR1000 or upgraded PR650 machines to one computer, for enhanced productivity. The PR1000 allows you to finish most multi-color designs faster, easier, and with greater precision than with most single or six-needle machines. Create professional results on a wide range of items with logos, monograms and more. Add the optional frames – from the jumbo 14"x14 frame and wide cap frame, to the border, cylindrical, round and quilt square frame for even more versatility. Let the PR1000 inspire you to create designs you've only dreamed of before! Shipping Dimensions (H x W x D) 41.75" x 29.62" x 32.5"